Pig farming is the raising and breeding of domestic pigs as livestock, and is a branch of animal husbandry. Pigs are farmed principally for food (e.g. pork, bacon, gammon) or sometimes skinned. Pigs are amenable to many different styles of farming: intensive commercial units, commercial free range enterprises, or extensive farming (being allowed to wander around a village, town or city, or tethered in a simple shelter or kept in a pen outside the owner’s house). Historically, farm pigs were kept in small numbers and were closely associated with the residence of the owner, or in the same village or town. They were valued as a source of meat and fat, and for their ability to convert inedible food into meat, and were often fed household food waste when kept on a homestead. Pigs have been farmed to dispose of municipal garbage on a large scale. All these forms of pig farm are in use today. In developed nations, commercial farms house thousands of pigs in climate-controlled buildings. Pigs are a popular form of livestock, with more than one billion pigs butchered each year worldwide, 100 million of them in the USA. The majority of pigs are used for human food but also supply skin, fat and other materials for use as clothing, ingredients for processed foods, cosmetics, and medical use. The activities on a pig farm depend on the husbandry style of the farmer, and range from very little intervention (as when pigs are allowed to roam villages or towns and dispose of garbage) to intensive systems where the pigs are contained in a building for the majority of their lives. Each pig farm will tend to adapt to the local conditions and food supplies and fit their practices to their specific situation. Almost all of the pig can be used as food. Preparations of pig parts into specialties include: sausage (and casings made from the intestines), bacon, gammon, ham, skin into pork scratchings, feet into trotters, head into a meat jelly called head cheese (brawn), and consumption of the liver, chitterlings, and blood (blood pudding or black pudding). This is also, technically, the case for all other mammals, although the demand is not really there. Pigs are farmed in many countries, though the main consuming countries are in Asia, meaning there is a significant international and even intercontinental trade in live and slaughtered pigs. Despite having the world's largest herd, China is a net importer of pigs, and has been increasing its imports during its economic development. The largest exporters of pigs are the United States, the European Union, and Canada. As an example, more than half of Canadian production (22.8 million pigs) in 2008 was exported, going to 143 countries. Older pigs will consume eleven to nineteen litres (three to five US gallons) of water per day. The way in which a stockperson interacts with pigs affects animal welfare which in some circumstances can correlate with production measures. Many routine interactions can cause fear, which can result in stress and decreased production. There are various methods of handling pigs which can be separated into those which lead to positive or negative reactions by the animals. These reactions are based on how the pigs interpret a handler’s behavior. Many negative interactions with pigs arise from stock-people dealing with large numbers of pigs. Because of this, many handlers can become complacent about animal welfare and fail to ensure positive interactions with pigs. Negative interactions include overly-heavy tactile interactions (slaps, punches, kicks, and bites), the use of electric goads and fast movements. It can also include killing them. However, it is not a commonly held view that death is a negative interaction. These interactions can result in fear in the animals, which can develop into stress. Overly-heavy tactile interactions can cause increased basal cortisol levels (a "stress" hormone). Negative interactions that cause fear mean the escape reactions of the pigs can be extremely vigorous, thereby risking injury to both stock and handlers. Stress can result in immunosuppression, leading to an increased susceptibility to disease. Studies have shown that these negative handling techniques result in an overall reduction in growth rates of pigs. Various interactions can be considered either positive or neutral. Neutral interactions are considered positive because, in conjunction with positive interactions, they contribute to an overall non-negative relationship between a stock-person and the stock. Pigs are often fearful of fast movements. When entering a pen, it is good practice for a stock-person to enter with slow and deliberate movements. These minimize fear and therefore reduce stress. Pigs are very curious animals. Allowing the pigs to approach and smell whilst patting or resting a hand on the pig's back are examples of positive behavior. Pigs also respond positively to verbal interaction. Minimizing fear of humans allow handlers to perform husbandry practices in a safer and more efficient manner. By reducing stress, stock are made more comfortable to feed when near handlers, resulting in increased productivity. In other words, pigs are very social and intelligent animals, and if they are treated well, better meat can be obtained. Prohand for pigs is a training program that teaches handlers to interact with pigs in a way that promotes safe handling. It promotes the development of positive behaviors and elimination of negative behaviors. This program has been seen to improve productivity without any capital investment. Hogs raised in confinement systems tend to produce 23.5 piglets per year. From 2013 to 2016, sow death rates have nearly doubled from 5.8%-10.2%, 25-50% of these deaths have been caused by prolapse. Other probable causes of death include vitamin deficiency, mycotoxins in feed, high density diets or abdominal issues. Currently mortality data is being collected by Iowa's Pork Industry Center in collaboration with the National Pork Board to collect data from over 400,000 sows from 16 U.S. states. The farms all range in different size and facility types. Raising rates in death are a profit concern to the industry, so money is being invested into research to find potential solutions of preventing prolapse. Pigs were originally bred to rapidly gain weight and backfat in the late 1980s. In a more fat-conscious modern day America, pigs are now being bred to have less back fat and produce more offspring, which pushes the sow's body too far and is deemed one of the causes of the current prolapse epidemic. Researchers and veterinarians are seeking ways to positively impact the health of the hogs and benefit the hog business without taking much from the economy. "Shoat" redirects here. It is not to be confused with Sheep–goat hybrid or Sheep–goat chimera. Pig, hog, or swine, the species as a whole, or any member of it. The singular of "swine" is the same as the plural. Gilt, young female not yet mated, or not yet farrowed, or after only one litter (depending on local usage). Baconer, a market pig between 65 kg (143 lb) and 80 kg (180 lb) dressed weight. The maximum weight can vary between processors. Feces and waste often spread to surrounding neighborhoods, polluting air and water with toxic waste particles. Waste from swine on these farms carry a host of pathogens and bacteria as well as heavy metals. These toxins can leach down through the soil into groundwater, polluting local drinking water supplies. Pathogens can also become airborne, polluting the air and harming individuals when ingested. Contents from waste have been shown to cause many detrimental health implications, as well as harmful algal blooms in surrounding bodies of water. 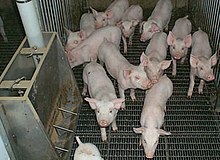 Most pigs in America get ractopamine to put on more muscle instead of fat, to put on weight more quickly, to reduce costs and to reduce pollutants in the environment because pigs on ractopamine do not need as much feed to reach finishing weight and do not produce as much manure. However, ractopamine has not been approved for use by the European Union, China, Russia, and several other countries. China once used colistin (an antibiotic) as growth promoter (subtherapeutic antibiotic use) but discovered a colistin-resistant form of E. coli bacteria in a pig from a Shanghai farm in 2013. Investigations then led to the identification of "a gene called MCR-1 that allowed bacteria to survive colistin treatment in animals and humans." In 2016, these findings led China to ban colistin as growth promoter. China uses sulfamethazine, bacitracin, chlortetracycline, tetracycline, florfenicol, sulfonamide, doxycycline, oxytetracycline, fluoroquinolone, macrolide, and trimethoprim, and stopped using colistin as of 26 July 2016. ^ Flisser, Ana; Ganaba, Rasmané; Praet, Nicolas; Carabin, Hélène; Millogo, Athanase; Tarnagda, Zékiba; Dorny, Pierre; Hounton, Sennen; Sow, Adama; Nitiéma, Pascal; Cowan, Linda D. (2011). "Factors Associated with the Prevalence of Circulating Antigens to Porcine Cysticercosis in Three Villages of Burkina Faso". PLoS Neglected Tropical Diseases. 5 (1): e927. doi:10.1371/journal.pntd.0000927. PMC 3014946. PMID 21245913. ^ "Full text of "The collection and disposal of municipal waste"". Archive.org. Retrieved 6 October 2018. ^ "The Lost Art of Cooking With Lard". Mother Earth News. Retrieved 6 October 2018. ^ "Ingredient: Lard". cosmeticsinfo.org. Retrieved 6 October 2018. ^ "Material from pig intestine is remedy for deep sores, incontinence". Purdue.edu. Retrieved 6 October 2018. ^ "Canadian Pork Exports". Canadapork.com. Retrieved 6 October 2018. ^ Hemsworth, P.H (2003). "Human–animal interactions in livestock production". Applied Animal Behaviour Science. 81 (3): 185–98. doi:10.1016/S0168-1591(02)00280-0. ^ Hemsworth PH, Coleman GJ, Barnett JL, Borg S (2000). "Relationships between human-animal interactions and productivity of commercial dairy cows". Journal of Animal Science. 78 (11): 2821–31. PMID 11063304. ^ Hemsworth, P.H. ; Price, E.O. ; Borgwardt, R. (1996). "Behavioural responses of domestic pigs and cattle to humans and novel stimuli". Applied Animal Behaviour Science. 50 (1): 43–56. doi:10.1016/0168-1591(96)01067-2. ^ Greenaway, Twilight (1 October 2018). "'We've bred them to their limit': death rates surge for female pigs in the US". the Guardian. Retrieved 17 November 2018. ^ "Considering the porcine future". Big Think. 2 October 2018. Retrieved 17 November 2018. ^ "Iowa Pork Industry Center - Iowa State University". ipic.iastate.edu. Retrieved 17 November 2018. ^ a b "Genetic manipulation for more salable pork or more pigs". Big Think. 2 October 2018. Retrieved 17 November 2018. ^ Nicole, Wendee (21 April 2017). "CAFOs and Environmental Justice: The Case of North Carolina". Environmental Health Perspectives. 121 (6): a182–a189. doi:10.1289/ehp.121-a182. PMC 3672924. PMID 23732659. ^ Thorne, Peter S. (21 April 2017). "Environmental Health Impacts of Concentrated Animal Feeding Operations: Anticipating Hazards—Searching for Solutions". Environmental Health Perspectives. 115 (2): 296–297. doi:10.1289/ehp.8831. PMC 1817701. PMID 17384781. ^ Guilford, Gwynn. "It's not just Ohio—poisonous algae blooms now plague 20 US states". Quartz. Retrieved 21 April 2017. ^ "Ractopamine — a beta-agonist growth promotant; from google (pig drug accumulate fat) result 3". ^ a b c "UK-China collaboration informs animal feed antibiotic ban". Medical Research Council. Archived from the original on 27 March 2017. ^ a b McKenna, Maryn (21 November 2015). "Apocalypse Pig: The Last Antibiotic Begins to Fail". National Geographic.